Kit Includes: Two front header panel units, two upper hood panel units and the two rear spoiler or deck panel units, depending on year. Plus one 40′ pre-spaced roll of paint mask tape. Left & Right two rear hood stencils. Left & Right rear spoiler stencils. A 40′ pre-spaced roll of paint mask tape is included to join the front header stencils to the rear hood stencils and to complete the stripe from the rear spoiler to rear window panel. Vinyl application squeegee to pressurize the stencil. Color photo’s of original car showing factory over spray. PPG paint charts for paint codes. How to sheet featuring a story from Chevy High Performance magazine. Kit is reproduced from original GM stencil kit and includes color photos & individual stencils, not something that has to be cut from a sheet. 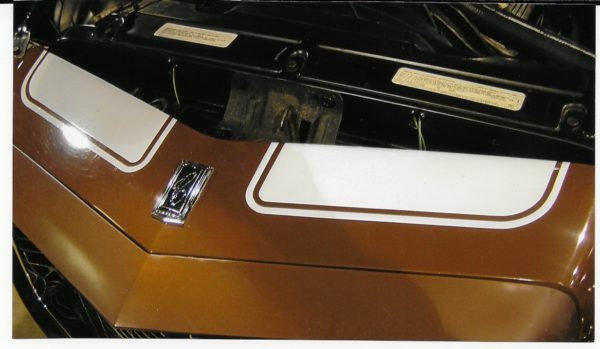 We Were Second…to offer complete paint stencil kits for the 1970 thru 1973 Camaro in 1984. Did you know GM Paint Stencil Kits normally were partial stencil kits with no measurements included? We are the originator of complete stencil kits with both instructions and color photos of original car stripes, when possible. Even the part number is used when possible.